Aligoté is a white grape used to make dry white wines, especially in the Burgundy region of France where it was first recorded in the 18th century. Tolerant to cold, this variety is also cultivated in Eastern European countries such as Romania, Russia, Ukraine, Moldova, and Bulgaria. With 45,000 hectares (110,000 acres), it was the 22nd most planted vine variety in the world in 2004. Aligoté is used to produce a varietal white wine, and is sometimes included in the blend of Burgundian sparkling wine known as Crémant de Bourgogne. 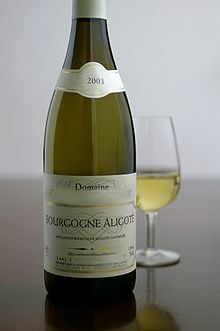 In the varietal appellation Bourgogne Aligoté AOC, up to 15% Chardonnay grapes may be blended in. Traditionally, the cocktail kir (also known as vin blanc cassis in French) is made by adding cassis to an Aligoté wine. Aligoté adds acidity and structure to other varieties when blended. The grape is often blended with Sacy to complement its acidity. In Burgundy, Aligoté often loses territory to more prestigious grape varieties and in some areas is only in less productive vineyard sections at the tops and bottoms of the slopes. The grape ripens early with moderate yields and produces wines high in acidity that can be drunk young. Its aroma includes elements of apples and lemons. Clive Coates says it is a variety very much of secondary importance in Burgundy which produces a light, primeur-style wine with slightly herbal flavour and rather higher acidity than the Chardonnay. The village of Bouzeron is considered to represent the region's finest examples of the variety with the appellation Bouzeron-Aligoté AOC restricting the yields to 45 hl/ha compared to the Bourgogne Aligoté AOC limited to 60 hl/ha. The grape is the second most popular white grape variety grown in Burgundy after Chardonnay, though it lies a long way behind in terms of planted area, with 1,700 hectares (4,200 acres) against 12,800 hectares (32,000 acres). The vines were once inter-planted and field blended with Chardonnay for the benefit of its added acidity but the vines have long since been separated. In Burgundy the grape can be found along the fringe edges of the Côte-d'Or along Route Nationale 74. It can also be found in Mâconnais and Côte Chalonnaise. There are also small plantings just east of the Rhone Valley around the city Die and in the commune of Pierrevert in the Alpes-de-Haute-Provence. It has its own AOC's, Bourgogne Aligoté and Bouzeron. Aligoté is also produced in Eastern Europe, Ukraine, Bulgaria, Romania, Switzerland and Moldova. In Bulgaria, the grape is prized for its blending qualities and high acid with more than double the quantity planted here than in the grape's ancestral home of Burgundy. The grape is primarily found in the Stara Zagora Province around Chirpan. In Russia it is used to make sparkling wines with varietal wines being made along the coast of the Black Sea around Gelendzhik. Aligoté has also been produced, although in very small quantity, by Australian wineries. The wine is also grown in Washington State where it is resistant to the cold weather. The grape is also used in California, mostly for blending. The Aligoté grape is also known by the names Blanc de Troyes, Vert blanc, Chaudenet gris, and Plant gris. There have been small, experimental plantings in Chile. In Canada the grape is also grown in Niagara by Chateau de Charmes. DNA fingerprinting has found Aligoté to be a crossing of Pinot noir and Gouais blanc, which is an ancestry which is consistent with an origin in Burgundy or nearby areas of eastern France. Synonyms for Aligoté include Aligotay, Alligotay, Alligoté, Blanc de Troyes, Carcairone blanc, Carcarone, Carchierone, Chaudenet, Chaudenet Gras, Giboudot blanc, Griset blanc, Karkarone Blank, Melon de Jura, Muhranuli, Mukhranudi, Pistone, Plant de Trois, Plant de Trois Raisins, Plant gris, Purion blanc, Selon Molon, Selon Odart, Troyen blanc, Vert blanc. ^ a b c winepros.com.au. Oxford Companion to Wine. "Aligoté". Archived from the original on 2008-08-08. Retrieved 2008-10-06. ^ Jancis Robinson, ed. (2006). "Vine varieties". Oxford Companion to Wine (Third ed.). Oxford: Oxford University Press. p. 746. ISBN 0-19-860990-6. ^ a b c "Bourgogne Aligote". terroir-france.com. Terroir-France, French Wine Guide. Retrieved 2018-03-20. ^ "Food and Wine Dictionary: Aligoté | International Recipes". Archived from the original on 2006-10-16. Retrieved 2007-03-24. This page was last edited on 12 October 2018, at 00:53 (UTC).